Once you've created your giving page, it's time for a preview! You can find a link/URL for your page in two places: (1) at the bottom of the Page Configuration menu and (2) in the Page Details tab at the very bottom. ProTip: When previewing your page, make sure to use an incognito browser window to eliminate false tracking and reporting on your testing views and transactions. After opening your page, you will notice right away that it is in Test Mode, which means that no real charges can be processed. During this time, we highly recommend you give the donation process a try using the available test credit card information below. This information can also be found by clicking the Test Mode question mark icon in the top right of the page. After completing the donation process in Test Mode, close your incognito browser window and head back to EverTrue to see your gift reporting. 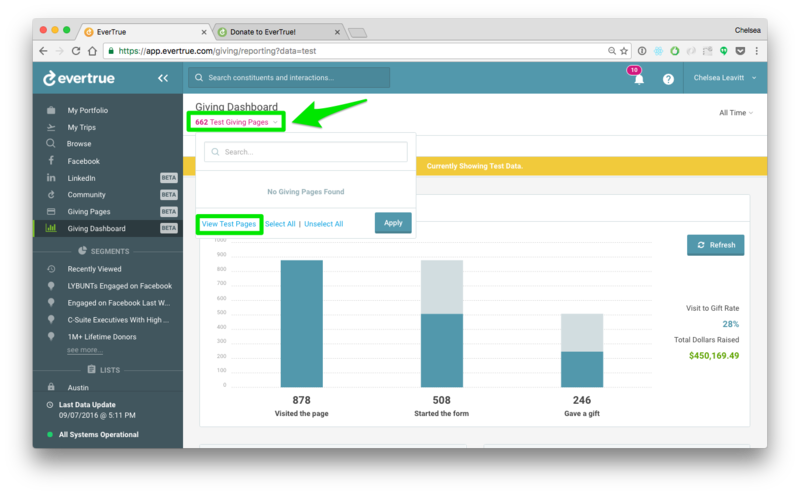 Check the Giving Dashboard for all things donations and giving analytics. While in Test Mode, you are able to view analytics, but by default test pages are filtered out. Use the page selection dropdown menu to navigate to your Test Page(s) and select the ones you'd like to view analytics and gifts for. 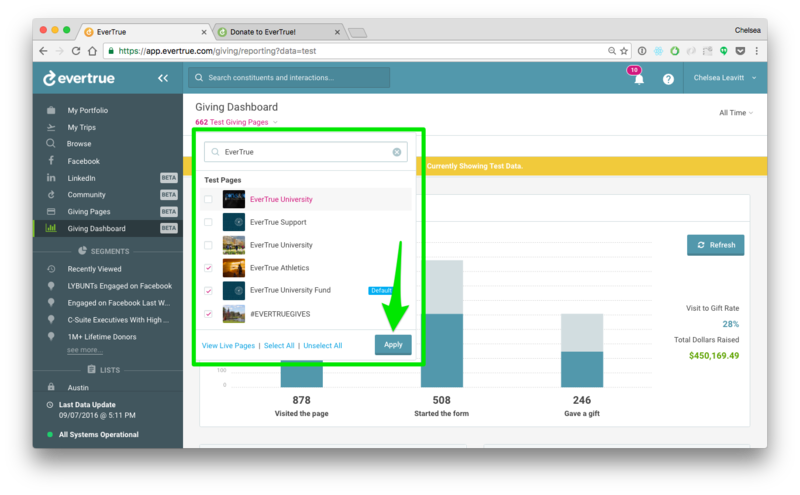 From there, have fun navigating around the Giving Dashboard and exploring your giving page analytics. Note, unless you are using a gift tracker, recognized email, or have created an appeal (for a test page), some of the data point may not be available in Test Mode. For more information on the Giving Dashboard, click here! After setting up your page, testing out the donation process, and making sure you are happy from start to finish with the final product, you are ready to go live at any time! 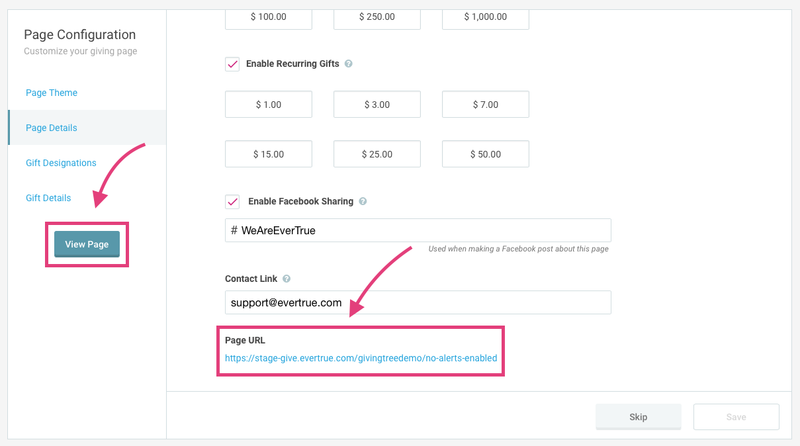 Any page in Test Mode can be made live by going to the Giving Page tab, opening up the Actions dropdown menu, and clicking "Set Page to Live Mode." Once live, you can officially begin accepting payments. Next steps - start promoting your brand new donation page! Note, you will be required to set the “Default Page” to Live Mode before setting future pages to Live mode as well. A Default Page is required in EverTrue to ensure that your donors always have a landing donation page to go to. This is specifically import for cases where another one of your giving pages may have been archived an no longer available to the donor.